Jeff Nidle, who completed his private pilot training with Empire Aviation in November 2009, took off for the first time in his fully restored Piper PA-22-150 Tri-Pacer today. The Tri-Pacer is a high wing, tube and fabric four seat airplane. Piper built close to ten thousand PA-22 aircraft between 1951 and 1963. Whether they were called Tri-Pacer, Caribbean or Colt, the basic aircraft stayed pretty much the same and taught generations of people to fly. The aircraft is often referred to as the “Flying Milk Stool” because of the three-legged appearance of the landing gear. There is a great article on the Tri-Pacer at this site. Paul Hesse flew with Jeff during the one-hour familiarization flight. 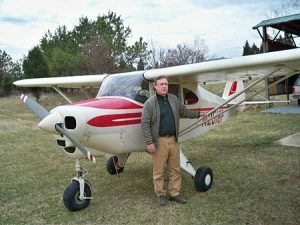 They took off from Winstead Airport (68NC), a 2,150 ft grass strip 10 miles to the northwest of Person County Airport (KTDF). What was learned from this experience? A new aircraft with high sink rates and where “fly by the seat of your pants” is a true indicator of what the airplane is doing. Pitch and rudder control is a must! Well done and congratulations Jeff!